The software features a Folder browsing option while selecting source file path. This way you can load an entire folder of MBOX files to open, view & export batch MBOX files. Once the MBOX file(s) is scanned, you can save the scanning for future. Rescanning the entire file can be avoided with this option which is useful in case of a large sized MBOX. 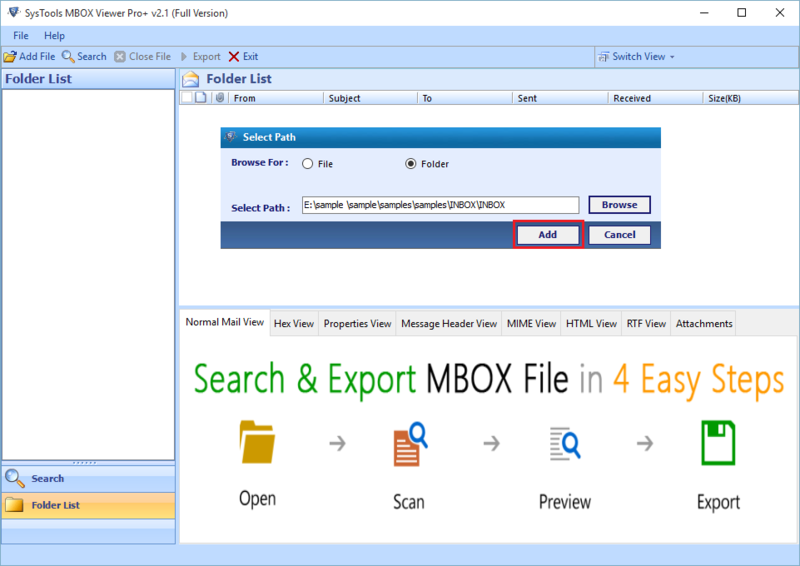 MBOX Viewer Pro+ maintains the folder structure of MBOX file while processing it. Folders that come under the storage path of the selected MBOX file are maintained in hierarchy. 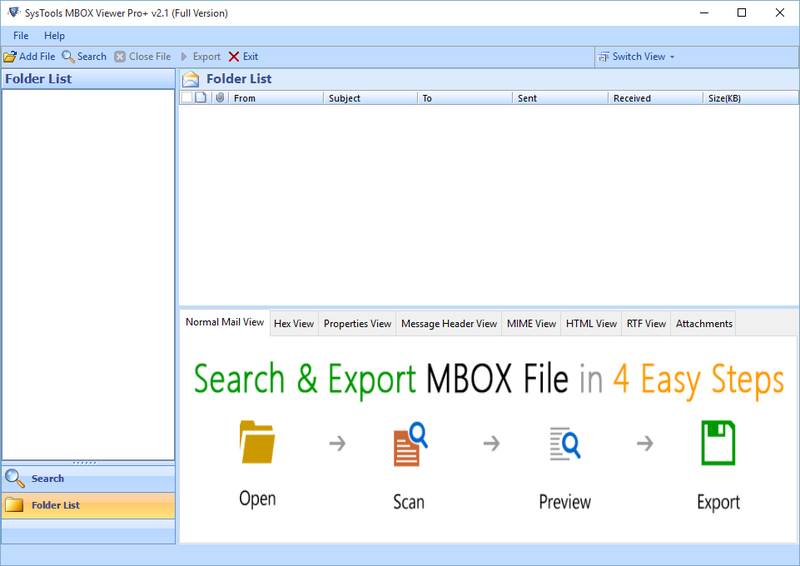 MBOX file emails can be exported to four output formats. 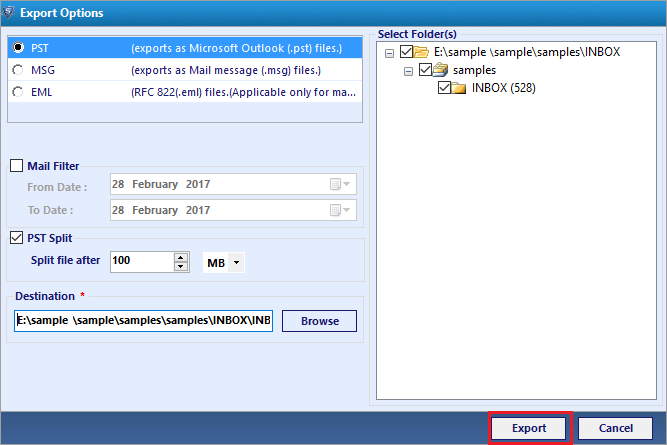 You can export MBOX to Outlook Data File (PST), Single Message File (MSG), Single Email File (EML) or Adobe PDF file. 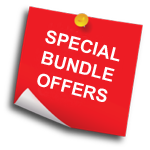 The software offers checkboxes against each email and MBOX file folder. You can perform the export of selective email(s) or folder(s) by using these checkboxes. Once the software has scanned MBOX File(s) you can also index items found in it. Indexing is a process that lists each email item found within the file, in its original sequence/order. View or export specific set of emails with the search feature. Use the Search option to look for an email/attachment and particularize it by applying different criteria & operators. A filter can be applied on emails to perform a selective export. You can specify a Date Range with a "From" date and a "To" date to set the range of emails to be exported. When exporting emails to PST format you can split the output into multiple parts. The feature lets you split PST file by size (MB/GB) to create multiple parts of the specified size. While exporting MBOX file emails into Adobe PDF file, you can apply Advanced Settings on it. The advanced setting option allows you to arrange internal formatting of the PDF file. 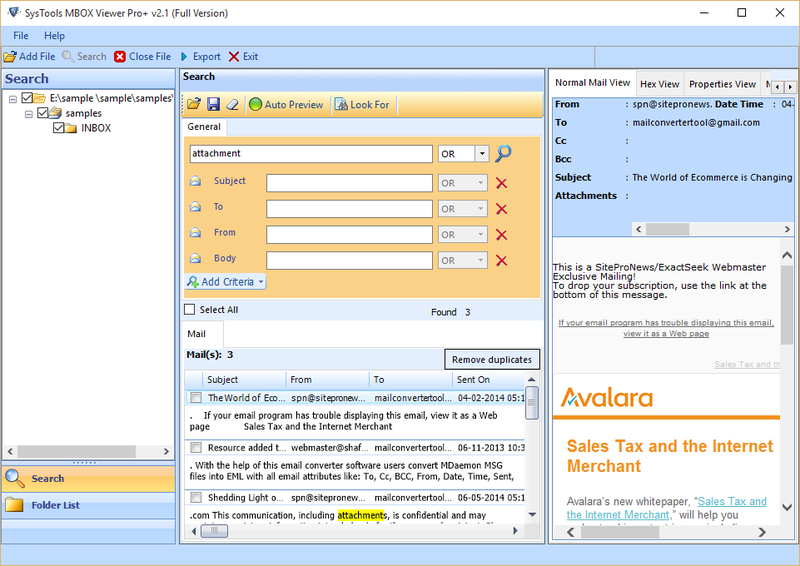 Demo version of MBOX Viewer Pro+ software only show the preview of the MBOX emails & attachments. Is it possible to view multiple MBOX files at a time? 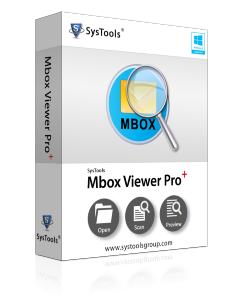 Yes, SysTools MBOX Viewer Pro+ offers two options to load and view MBOX files: by file and by folder. Using the Folder option, you can load an entire folder of MBOX files and view them at once. How can I find a particular email for view & export? I just want to view application emails from my clients. How can I particularly look for them and export them too? Using the Search feature of the software, you can use a search term and define the type of email you are looking for. Moreover, search criteria and operators can be added to particularize the search. I have a Windows 8 machine. Can I still use this software? The MBOX file I want to view belongs to Apple Mail but now I have a Windows 8 machine. Can I still use this software to view the file? Yes, the software is completely Windows based thus, operates smoothly on all its versions including the latest Windows 10, 8. And in addition to that you can view MBOX file of 17+ email clients successfully. Is it possible to open MBOX file of any size? I have an MBOX file with a large number of emails, and scanning it again and again would be tiresome process. Is there a way to avoid this inconvenience? Yes, you can open, view as well as export MBOX file of any size. And by saving the scan you can avoid rescanning it time and again in future. How can I access my MBOX file emails on Windows Live Mail? In order to make your MBOX file emails accessible on Windows Live Mail you can export them into EML format which is supported by the respective client. Are attachments in an email exported into separate folder ? No, It will export attachments into corresponding email pdf file. You need to View/Save attachments by click on paperclip clip icon in exported PDF file. Are attachments Inline within an exported PDF file ? No, The attachments will be embedded in the same PDF file in its original format and attachments will open into native format application. For Example: A word(.doc) attachment will be open into Microsoft Word application or other application which support .doc format file. Will the PRO Version allow to merge all emails in single PDF File ? No, It will create single pdf file for each email with corresponding attachments. My MBOX file was an archive of an old Thunderbird profile, and had lots of emails. I wanted to convert it into PST but was scared of exceeding the size limit and corrupting it. Thankfully the tool had suitable provision for it – PST split option. The unavailability of Apple Mail made me think I couldn't access my mail ever. However, thankfully the tool not just offered a detailed preview but also let me convert it to PDF making the file accessible anytime, anywhere.